The noted choral and orchestral conductor was born in Budapest in 1964, graduated in Ferenc Liszt Academy of Music Budapest. 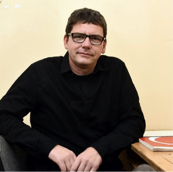 He is presently the chorusmaster of Kodály Choir Debrecen, the chef conductor of Eger Simphony Orchestra since 1995, the musical director of opera department in Csokonai Theatre Debrecen, artistic director of ChamberOpera Festival Eger. More than one decade he acted as conductor and choirmaster of Hungarian State Opera. Besides a wide range symphonic, choral and opera repertoire he produces special concert, theatre and opera productions combining different genres of arts. He is devoted to popularizing contemporary music as well so several firs performances are linked to his name and his ensembles. He was professor of choral conducting department of Ferenc Liszt University of Music Budapest for many years but his teaching activities are still rich leading a youth orchestra in Budapest and teaching in music faculty of University of Debrecen. He puts a great emphasis on musical education of youngsters creating and leading special performances to them including workshops for mental disable or socially wounded children too. Mate Szabo Sipos is in demand as conductor and adjudicator throughout the world and often gives master-classes of conducting as well. His versatile activity is extended with composing and stage directing too. Donizetti, Gaetano: Don Pasquale - Chorus "Che interminabile andrivieni"